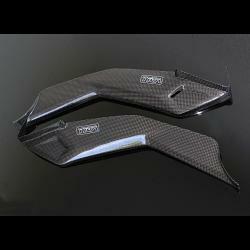 Carbon under-tank covers for MSX125 Grom. Fits over nasty plastic stock items and transforms the appearance of your bike. Install with double sided tape provided or with silicone sealant for a really permanent installation.